The weather was so harsh here this afternoon that Tom (the guy in the cap) and some of his buddies sat out on the porch to play dominoes (yes, they actually play dominoes). 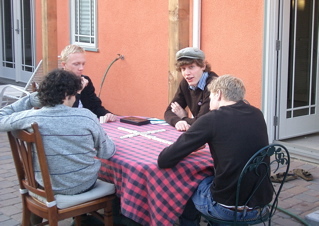 Looks like a bunch of young punks brainstorming Crucifixion-like! (Violence: bad. Planning ahead: good. Damn you, Mel!) But I was raised paranoid. Merry Christmas to all participating time zones.